And I'm ending the year with only three WIPs: J's gray scarf, my mother's cabled tube scarf, and the sweater for my coworker. Tomorrow I hope to give you a peek into the stash and a preview of what projects I might be knitting in the year to come. I wish you all a very happy, healthy New Year -- may 2007 bring you much happiness, much stash enhancement, and many hours of happy knitting! 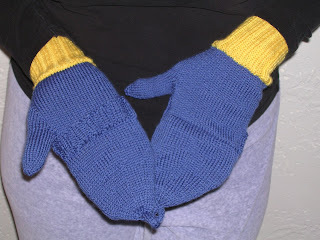 My brother specifically requested a pair of these convertible mittens (or glittens, as I like to call them), and as he never asks for anything hand knit, I didn't think it wise to second guess. I promptly picked up some yarn in his school's colors and got to work. In the cuff section, following the 30 rows of k2p2 ribbing, you will need to increase a total of 12 sts to go from 48 to 60. If you follow the pattern as written for the increase row (which reads "Work *k3, INC 1. * Repeat to end. "), you will wind up with four more stitches than you need (64 instead of 60). To increase the correct number of stitches, you should work *k4, INC. 1* around for one round. In the decrease portion for the mitten shell, the section reading "On each needle" does not specify that for each decrease direction, the decrease pattern will be followed twice on each of the four needles. Thus eight (8) sts are decreased on each decrease round -- and so the stitch count given after the first line is incorrect. After the round worked as k5, k2tog, you will wind up with 48 stitches, not 52. The final line of this decrease section instructs you to K2tog around, and the next instruction is to knit I-cord with the four stitches remaining. However, if you k2tog the previous round, you'll wind up with 8 stitches, so you'll need to knit this round twice to wind up with the required 4 sts for the I-cord. Reunited -- and it feels so good! My poor, lonely Pomatomus is lonely no more! 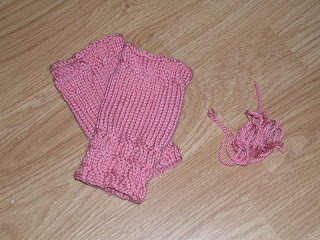 Although these were officially the first pair of Pomatomi I started, they became the third pair completed. After finishing the first sock, you may recall that I became a tad bit obsessed with reversing the pattern so that the lace pattern would be mirrored on each foot relative to the other. 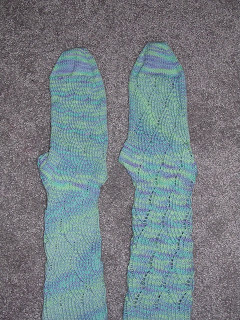 I completed two test socks, both reversed, and then finished a pair for my mother with one reversed and one normal. By the time I got around to making the mate for the very first sock, I was so anxious to be done that I just followed the pattern as written. I think I've now had enough of this pattern and will be putting it away for a while. 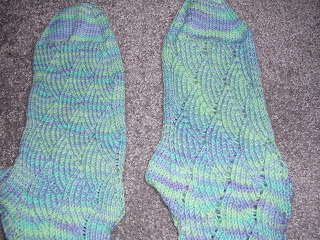 Here you see first/dpn sock on the left and second/circs sock on the right. 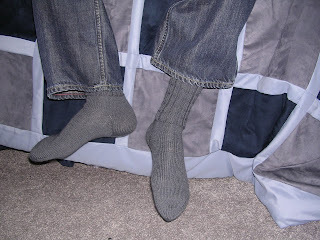 See how much more open the second sock is, and how the individual stitches are easier to see from afar? I can't imagine my tension differed that drastically from one sock to the next, but who knows. Then there's the way the stitch pattern worked out, even though I followed the same charts both times. Specifically, take a look at the right border of the pattern on both feet. The first sock (at left) had normal looking scallops, while the second sock (at right) had these weird things that seemed to be half the width but twice the length of the normal scallop. If I weren't so ready to be done with this pair of socks, I would have frogged and started the foot over; to be honest, it bugs me a little, but really, who's going to see that part of the sock when I wear these? 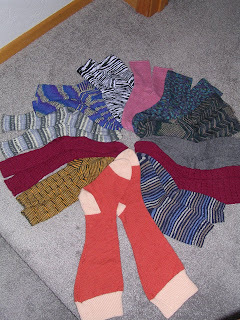 The most important part here is that I've officially matched up all the single socks with completed mates, thereby completing all sock WIPs for 2006 -- or should I say 200-sox. Huzzah! Monday: A preview of knitting to come in 2007, or "A Journey into the Stash"
Spent Christmas in suburban D.C. with longtime family friends. Wore my Pumpkin Pie Socks on Christmas day; friends were sufficiently impressed. Spent hours in the car and sitting around working on a pair of "glittens" (in U of M colors, of course) for my baby brother and a DB Baby Cashmerino tube scarf with self-designed cable pattern for my mother. Pictures of both to come. Along with my J, made out like a bandit celebrating the holidays. We received several items from our registry, including my long-coveted Kitchen Aid Artisan Mixer (the red one). Some extremely smart people -- my aunt and uncle and J's parents, to be exact -- gave me yarn! Well, gift cards to Knit One, so I can buy yarn without guilt of breaking my yarn diet. All that, plus throw in a lot of sleeping, some shopping, and some doctor's appointments, is the last week in a nutshell. It seems I've also been lax in responding to the meme for which I was tagged by Rose. This is the probably (by now) well-know "Six Weird Things" meme. So, if you really care to know, here are six weird things about me. I cannot leave the house without making the bed. On the few occasions where I've overslept and had to jump into the shower without making the bed, it's bugged me literally all day (and what do you think the first thing I did was when I got home from work?). It's a sickness, I know; my roommate my senior year of college even once said to someone else that I "make the bed with one foot out of it." Most nights, especially when I'm home alone, I sleep with a stuffed elephant that I made when I was a teenager (late middle school or early high school). 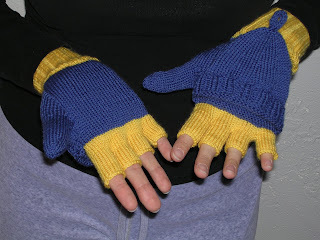 It was made from recycled long underwear -- you know, that waffle-y material? I sleep with it tucked under my chin, liked another pillow. I used to be so attached to it (when I lived alone, I feel I should add) that I would wake up if it managed to fall out of bed in the middle of the night. I'm a high-anxiety individual. I have a lot of phobias, chief among them flying, heights, enclosed spaces, and snakes. I can cry at the drop of a hat, even at commercials. There are plenty of movies I have to watch with a box of tissues next to me. 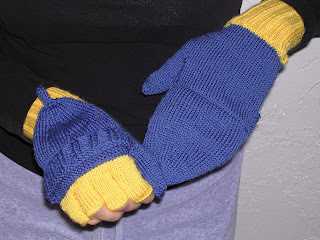 My hands get freakishly dry in the winter, and it's mostly unrelated to knitting. The latest bizarre dryness has manifested itself in peeling palms. Ick! I could eat pasta for dinner every night and probably not get bored. Quite frankly, I live on carbs; I could never go on one of those low-carb diets. I tag Jen, Jenn, Amanda, Donna, Heather, and YOU (if you haven't done this yet). 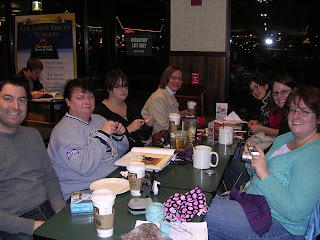 Tonight, an experiment: the girls and I are getting together to knit at Barnes and Noble at the Waterworks on a non-Wednesday night to see if 40 guy shows up! 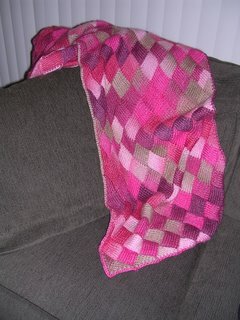 I promise I'll be posting at least once more before the new year; I'm planning a retrospective of my 2006 in knitting. In the meantime, wish me luck as I attempt to finished the mate to my first Pomatomus. I'm through the gussets, but I've been seduced by the allure of the mate to the first glitten, which must be done in time to go back to Ann Arbor with brother on 1/3. These were the first socks I truly designed myself, although I'm the first to admit they're nothing extraordinary. 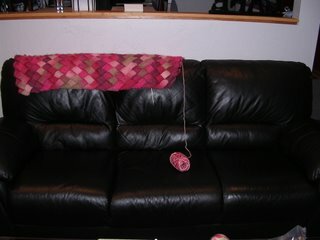 The yarn was bought on closeout at WEBS, although the colors were different in person than they appeared on the screen. The pumpkin-y shade was pretty accurate, but the contrast color turned out to be a light peachy shade rather than the cream I was expecting. Still, these two together reminded me of a slice of pumpkin pie topped with a generous dollop of whipped cream. 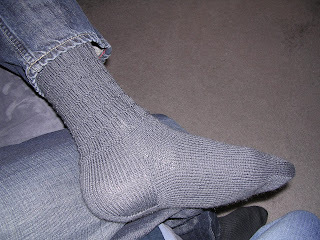 The design is relatively simple: pure stockinette with a twisted 1x1 rib at the top (for added elasticity to keep the sock up) and a slip-stitch heel. 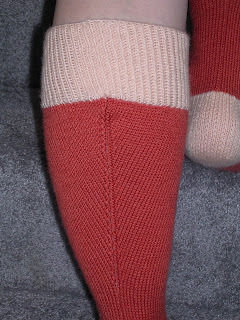 The last stitch of each round in the stockinette portions was purled to create a faux seam up the back of the leg, and the paired decreases (K2tog and SSK) were done on either side of this stitch. The resulting slant given to the stockinette around the calf results in a nice tailored fit along the contour of the calf muscle. I started this sock with two skeins of each color, and used one of each while knitting each sock, but there is probably enough yardage left to make a another (obviously shorter) pair in the opposite color scheme. I'd be happy to share the pattern with you, but I don't think you'd really want it, as it's written to match my specific leg measurements -- much like Grumperina, I have rather shapely calves. 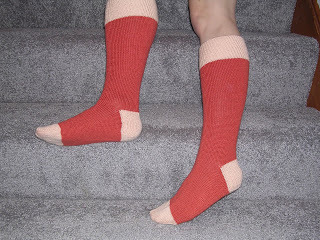 If there's any interest, I'll be happy to write up a tutorial on how to design your own socks like these. Although these certainly took a little longer than the average pair of socks (though not much, what with all the stockinette), I know these will definitely not be my last pair of knee highs. If you've been paying attention to the calendar, you already know that tomorrow night -- that would be Wednesday, December 20 -- is the third Wednesday of the month, which means knitting night at the Waterworks Barnes & Noble! I will be there, along with the usual knitters and, undoubtedly, the usual characters. 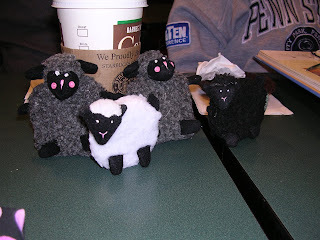 I've also heard rumors that some other knitters and knitbloggers may be there (we may even see the return of Lori, who's been long absent from this group), and The MWP may even join us. If we're really lucky and I'm especially persuasive, J might even make an appearance. Made up the fair isle bit as I went along, never carrying the yarn more than five stitches at a time. 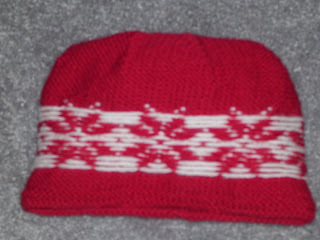 It's supposed to look like a red hat that has snow falling on it. 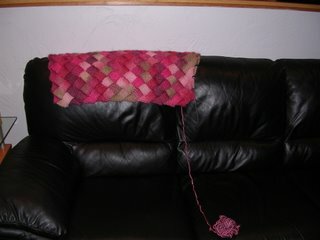 The recipient is only about a year and a half old, so I doubt she'll pay much attention to the pattern anyway. 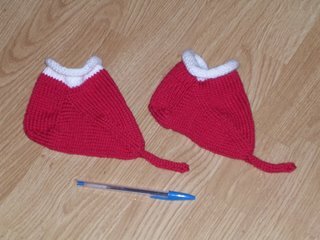 Blocked last night, still a bit damp, but both hats will be ready for the girls when we see them for brunch on Saturday morning. I'll see if I can't get approval for a blog-worthy shot of the two of them. On tonight's agenda: finish up the second of the Pumpkin Pie Socks (I'm literally about to start the toe of the second one) and block both, then start a mate for the poor, lonely original Pomatomus. I've been hearing a weird sound coming from the stash lately, and as it turned out it was my poor pathetic single Popo, who is longing for its special someone. 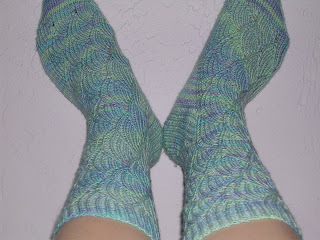 (I only finished it back in May -- the sock's been living in the stash longer than I've been engaged!) My goal is to finish up the mate before the end of the year. I think it's doable. His next pair of socks will be bright red, as requested, but they'll be the boring usual (i.e., Plain Winter Sock). I think I could probaby knit a pair of those in my sleep. Meanwhile this weekend, while J did work on his computer most of Saturday afternoon and evening, I used up some stash making a hat for his little cousin, who will be the flower girl at our wedding. This gave me another good chance to practice my fair isle technique. All in all, a very satisfying knit. The fair isle portion is a bit wonky still, but I think it'll even out with blocking. The recipient is about 3 years old, so this may be a tiny bit big on her, but I thought it would be better for her to have room to grow into it. (Sorry for the photo quality; for some reason the camera wouldn't take a non-blurry photo.) 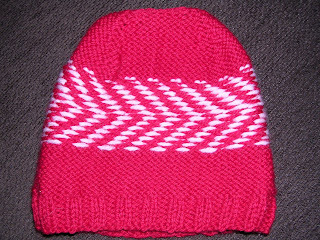 I've already started a smaller hat for the flower girl's little sister, who's about a year and a half old. 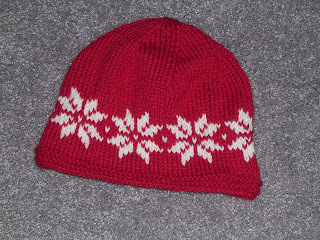 This one will have a roll brim in red, and then I'll slowly work in the white a stitch at a time to transition to all white -- the idea is to look like snow falling -- probably ending with an umbilical cord knot at the top. Should be another fast and satisfying knit! This yarn was a very acceptable substitute for DB Cashmerino Aran. The resulting fabric was soft and squishy, and I know it will be nice and warm. Perhaps most impressive? From the stash. I wound up with two skeins of this (along with two skeins in a mustard-y gold shade) as part of the Stitch 'n Pitch giveaway goodie bag. 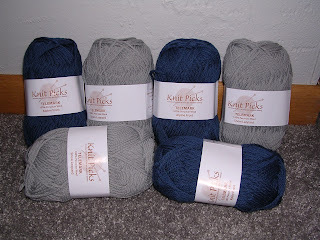 This would be my final yarn purchase before the beginning of the self-imposed yarn diet. This is all Telemark (100% Peruvian wool) in Alpine Frost (blue) and Snow Leopard (gray), destined to be my first official fair isle project. These will have to wait for a bit until I finish up some other projects and obligation knits, but I'm excited to get to them so perhaps they'll be a motivator. This evening I got home and found another surprise -- a package from my Sockret Pal! She sent me a great book, which will come in handy for some comic relief when the wedding planning starts to get stressful. Thank you, Sockret Pal! This was so thoughtful of you! 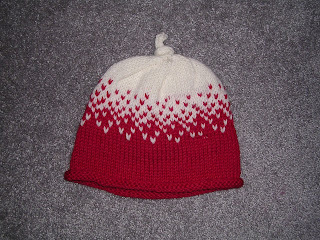 Finally tonight I leave you with the promised shot of the inside of the hat I knit last Saturday. All you experienced fair islers out there can tell me how my floats look and what you think of my tension. Perhaps you can also give me some good hints on how to weave in the ends in fair isle. Is there a correct way to do it? I've looked through all my general reference book and none of them has any tips on this. Despite the fact that J and I spent much of the weekend running around (I'll get to why in a minute), I was incredibly prolific in terms of my knitting. First of all, there were these -- yes, another pair! These are for my best friend from college, who will be my maid of honor at my wedding; her birthday is next week. I started these after dinner on Friday night, but got very little done as we were both beat and turned in for the night at 10 p.m. Most of the knitting was done in the car while we went computer shopping and while sitting in J's office yesterday while he took care of some business. Having gone through all the Debbie Bliss Cashmerino Aran from my Sockret Pal, I stash-busted with these and used up one of the four or five skeins of Aurora 8 I'd bought way back when. I think this color is more her anyway, and I love how sproingy the fabric is knitted up. If you're counting, yes, this is my third pair, and certainly not the last. I've already started a fourth pair, this one for a friend of J's who uses an electric wheelchair (which she operates by hand). We had dinner with her Saturday night and she was remarking how her hands cramp up in the cold weather. She mentioned that she uses those little self-heating packs, but lacks a good way to keep them in place (mittens make it difficult for her to steer). 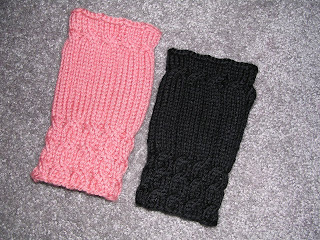 So of course I offered to make her a pair of wristlets. I started them this morning, so expect to see them later in the week. If you're wondering about the title of this post, you're not alone. I present for your consideration the back of the tag from the Aurora 8. Take a look at the description of the fiber content. 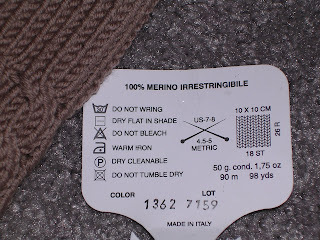 Yes, you read that correctly: apparently this yarn is not only 100% merino, it's also irrestringible. I have no idea what that means, but it sure sounds funny. Please feel free to enlighten me if you are so wise as to know what this term means! I made up the stranded design as I went along -- notice I'm not showing you the back, where there's one spot where the design didn't quite work. 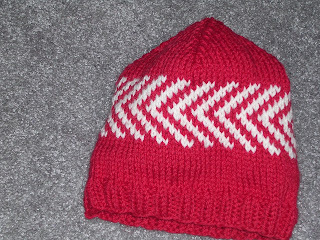 I did the colorwork using a two handed technique, with the main color in my right hand and the contrast color in my left (to practice for this, I knit several rows in red before the two-color portions continental). I'm actually very pleased with how this turned out. My tension was fairly even and my floats aren't too tight. I should have remembered to take a shot for you of the inside; next post, I guess. So now, I've mentioned that we spent part of the weekend computer shopping, and I'm sure you're wondering how that worked out, aren't you? This post brought to you by my brand-spanking-new laptop! (Sorry about the flash glare there.) This was my Hannukah (and birthday, I've decided) present from J. He'd had enough of me complaining about my old laptop and how slow it was and how it would freeze up. I didn't think of it as being that old, but it was more than four years old and had seen me through the last year of college and grad school; four years is a long time for computers! So now I'm blogging on my new toy, which is immensely better (although I keep bumping the scroll bar on the side of the mouse pad by accident, which is rather distracting; I'll have to get used to this keyboard). 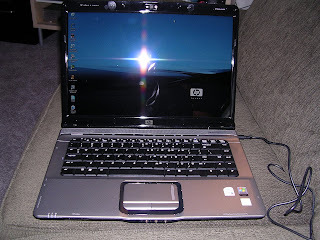 This is an HP Pavilion something-or-other. Aside from being much faster and lighter than the old model, this one has a built-in microphone and Web cam, so I can talk to my kid brother on Skype when he's away at school. J returned to Chicago this morning, so tonight is a chick flick and work on his scarf (I did frog and restart with another skein, and the six inches or so I've since knit have earned his seal of approval). Happy Monday -- or what's left of it! Yep that's another Fetching pair of wristlets, along with the leftovers from the one skein of Cashmerino Aran (noticeably less that last time, but I think that's because I was a tad bit more generous with the ends to weave in this time around). The specs are the same as the last pair. 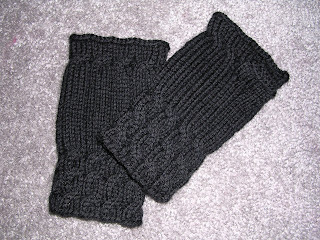 These are for J's brother's girlfriend, and -- more importantly -- these officially mark the end of my holiday knitting! (No nasty comments, please. Remember that I'm on my own during the week so all I've been doing is knitting.) You want a reminder of everything I've knit, so you'll be sufficiently impressed? Why, of course! I'm off to -- well, you know. Looking for something interesting to read until my next post? I suggest you see who was in my area yesterday (I'll bet they salted the roads for them!). Thank you all for your very kind comments on Lady Eleanor. I'm so happy with how she turned out, especially with the blocking -- she's now long enough to really wrap oneself up. J took a look from Chicago and has assured me that his mother will just love it. 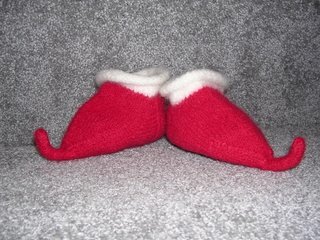 These were inspired by Wendy's Pixie-feet slippers. 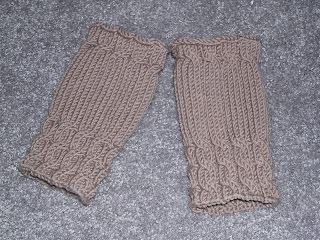 These are a quick knit and make a great gift if you need to do some last-minute Christmas knitting. I whipped up the second one of these on Sunday afternoon during the Steelers game. Using CC, CO 45 sts and distribute evenly over three needles (15 sts on each needle). Join for knitting in the round, being careful not to twist sts. Knit 10 rounds with CC. Switch to MC and K 2 rounds. K 11 sts from Needle 1, turn (transfer 4 remaining sts on Needle 1 to Needle 2). Sl 1, P 10 sts from Needle 1 and 11 sts from Needle 3, turn. These 22 sts will be worked back and forth for the heel flap. Distribute remaining sts over other two needles. Repeat rows 3 and 4 until all stitches have been worked (note: on last two rows, you will Sl 1, K or P to one stitch before gap, SSK or P2tog -- this will be the last stitch). K across 12 heel sts. With Needle 2, K 23 instep sts. With Needle 3, pick up and K one st between instep sts and flap and 12 sts from side of heel flap, then K 6 sts from Needle 1. Row 1: On Needle 1, K to last 3 sts, K2tog, K1. K 23 instep sts on Needle 2. On Needle 3, K 1, SSK, K to end. Repeat rows 1 and 2 until 44 sts remain (10 sts on Needle 1, 23 instep sts on Needle 2, 11 sts on Needle 3). Knit even until foot measures 4 inches. Row 1: On Needle 1, K all sts. On Needle 2, K 1, SSK, K to last 3 sts, K2tog, K 1. On Needle 3, K all sts. Row 3: On Needle 1, K to last 3 sts, K2tog, K 1. On Needle 2, K1, SSK, K to last 3 sts, K2tog, K 1. On Needle 3, K 1, SSK, K to end. Repeat rows 3 and 4 until 10 sts remain (2 sts on Needle 1, 5 sts on Needle 2, 3 sts on Needle 3). Combine the sts on Needles 1 and 3 onto one needle. You will now have two needles with 5 sts on each. 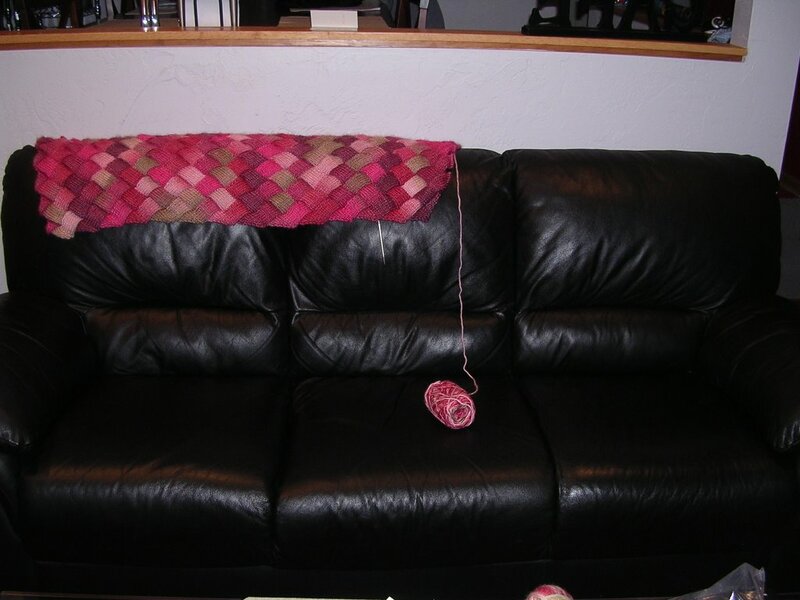 Turn work so that yarn is at the right. K first st on front needle together with first st on back needle and continue across (as for a three-needle bind off). You will now have 5 sts on one needle. Work Icord for 2.5 inches. Cut yarn, leaving a 10"-12" tail. Pull through the loops on needle. Thread yarn through the center of Icord tube, pulling it out inside the toe. Weave in this and other ends. When you've made two of these slippers/socks, place them in a cotton pillowcase and close securely. Felt in a washing machine until fabric has reached its desired state. Shape toes by curling then back and allow slippers to dry. 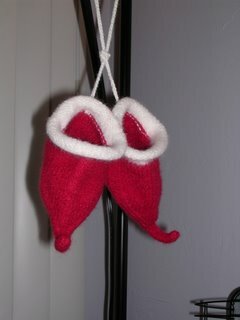 If desired, sew a bell or pom-pom to the end of each toe. Using CC and leaving an 8" tail, crochet a 20" cord, pulling each st tight. Cut thread, leaving an 8" tail. Using tapestry or darning needle, thread one end of the cord through the back of each slipper at the point where you joined the MC. Secure end and cut. Tie a knot in the cord and hang it on the tree! I am so, so pleased with how this turned out. After adding a few extra tiers (maybe four? ), I blocked the hell out of this baby yesterday, as you can tell from the final dimensions. I put on the final row of single crochet this evening, and it's done! Obviously, if you have this book and know the pattern, I did not use the yarn called for; trek figured out that to do so would cost a whopping $374. I don't know about you, but I don't have that kind of money laying around and I think J would kill me if I spent that much on yarn for one project (we are saving up for a house, after all) -- not to mention that this was one of many gifts I'm knitting for the holidays. I was originally going to use Noro Kureyon, but I coulding bring myself to spend even the roughly $80 or $85 it would cost me for a bag on eBay. Then, when I stopped in a Michael's when we were out one day, I came across this yarn and thought it would be perfect. When I finally made my purchase, I got lucky and stumbled across a sale! For 12 skeins of yarn and a pair of needles, I only spent about $64. And since I have four skeins left from the original purchase, I'll get another project out of it, too. The yarn is quite lovely. It's very soft and the color changes are subtle. I does get rather fuzzy as you work with it, but I found that blocking smoothed the fabric out well. One (potential) downside to this yarn is that is does not stand up well to frogging. Maybe this won't bother you if you're the kind of knitter who never makes mistakes, but I'm not that kind of knitter. There were a few instances where I wasn't paying attention and made a mistake like decreasing on the wrong end of the row, and then I found myself having to rip back the whole rectangle or triangle -- which usually meant literally ripping the yarn away from itself where it had kind of fused to itself. On the other hand, this property made for very easy connecting of new skeins of yarn -- felted joins all around. I'm still undecided about what to do with the leftover yarn. I would like to see how this yarn felts up, so I am thinking perhaps of some felted pillows or another, bigger French Market Bag to hold WIPs. I won't get to either just yet, as there are still just a few more holiday projects to do! Tonight, I leave you with a pictorial timeline of Lady E's life to date. You've seen some of these shots before, but now they are all lined up with a final shot at the end. Enjoy. Apparently all it takes is a little bit of kvetching on my part and some of you decide to come out of the woodwork. Hello, new readers! (or perhaps you're old lurkers?) I know there are more of you out there, however. How do I know, with such certainty? Because I've been playing with my new toy, Google Analytics. J directed me to it when I commented to him that I was curious how people were getting to my blog (I didn't mention the bit about no one commenting and wondering if anyone was actually visiting the site, but that was part of it). I keep reading on blogs that people have found that visitors have come to their site as part of a random Google search, usually some really bizarre phrase. Well, my new toy doesn't tell me that, but it does give me a report of how many people are visiting the site and breaks down that number into how many are new and how many are returning visitors, gives details on how vistors are getting to the site (for instance, from Google, the Sockret Pal blog, or Jen's blog), etc. My favorite is the info it gathers on where visitors are geographically. One report shows a map of the world with pinpoints for where visitors are, and another lists number of visitors by country. As I would expect, most of my readers/visitors/webstalkers are from the United States, but there are a handful from Canada as well. Most surprising? The visitors from Germany, New Zealand, Australia, and Kuwait. 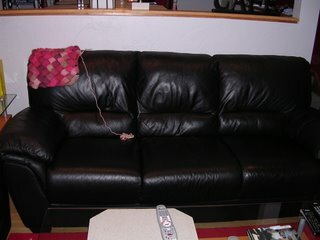 (Do people knit in Kuwait? I thought it was pretty hot there.) Fascinating! I hope that if you're one of these international visitors you'll leave a comment and share some international knitting content! 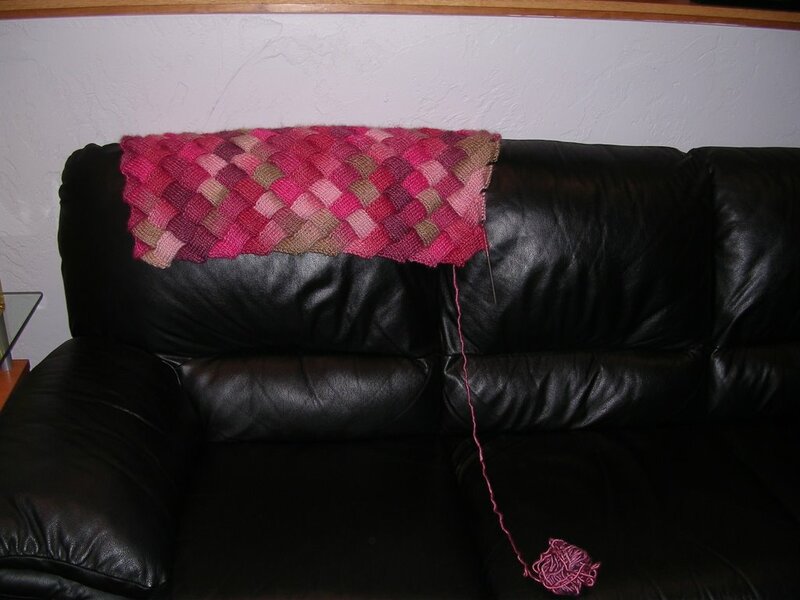 And now here we are back to present day, most of the way through the seventh skein. You see on the right what will be the eight and final skein. You ever have that experience where you're knitting and knitting on something and you don't seem to be getting anywhere, and then all of the sudden the thing is huge? That seems to be what happened here. I kept measuring it and it never seemed to get any longer than about 26 inches -- and then suddenly last night it was something like 54". 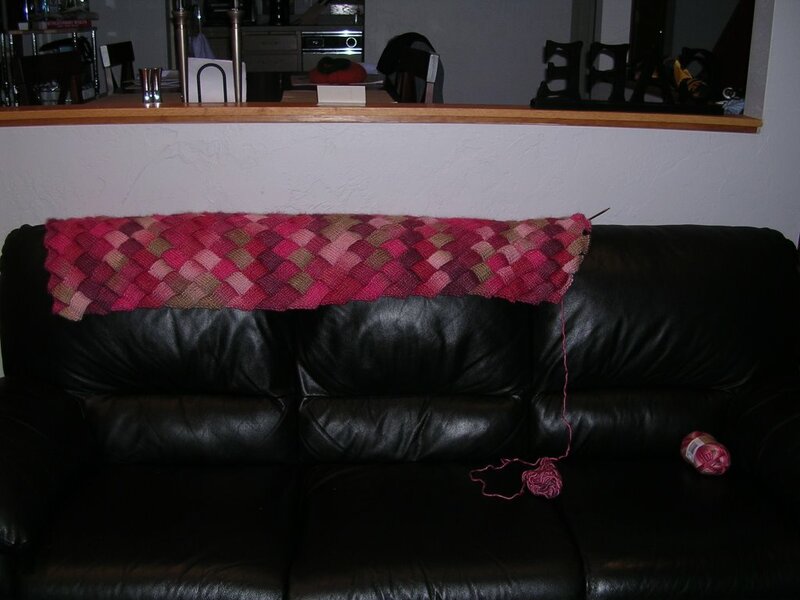 I figure that once I finish this skein and use up the last one, it should measure in the mid-60s, and a good blocking might get it to close to the 70-72 inches I'd like it to be. That will leave me with four untouched skeins and I'll have to come up with something interesting to do with them. A large French Market Bag to hold WIPs? 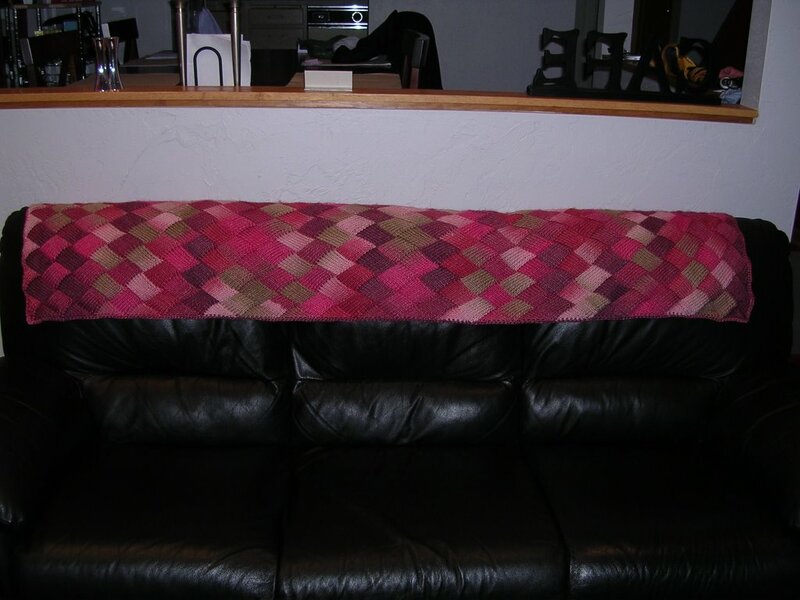 A felted pillow for the couch? Slippers? Share your ideas -- I'm sure you've got some. J is finally home now after being stuck in Chicago this afternoon. I've finished the ribbing on his second sock, so it's all smooth sailing from here (aside from the fact, of course, that I won't be able to work on them this weekend while he's around). Maybe I'll even get in a second pair of socks for him in the next two weeks!